Andrea Snyder and her husband, David, were already well-established in the restaurant business when they decided it was time for a new challenge. The Snyders founded Urban Cookhouse in 2010, and in the nearly eight years since, the business has expanded to 13 locations – four of which Snyder operates directly. Snyder, who said she has always had an entrepreneurial spirit, wanted to capitalize on the trend in food with acai bowls and juicing – and the idea for her newest restaurant, Farm Bowl + Juice Co., was born. Farm Bowl opened in January in Homewood. The restaurant is doing well and Snyder said they are considering franchising already. 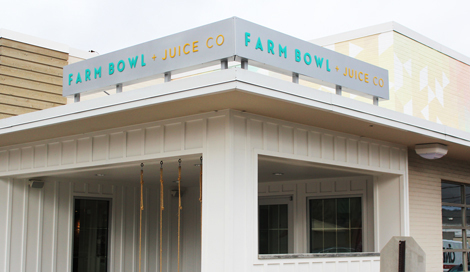 Farm Bowl + Juice Co. in Homewood, a new concept recently opened by the owners of Urban Cookhouse. The Birmingham Business Alliance’s Victor Brown thought Farm Bowl was a perfect concept for the Alabama Launchpad, which helps high-growth companies start, stay and grow in Alabama and is a program of the Economic Development Partnership of Alabama (EDPA). Synder was hesitant at first, but eventually applied. Though Farm Bowl didn’t win the top prize, being surrounded by other entrepreneurs in the Launchpad pushed her to be a better entrepreneur herself and also allowed her to become an advisor for other entrepreneurs, just as Brown had advised her. Brown, who is BBA’s vice president of business development, along with other BBA staffers in economic development, innovation and technology, and communications, have coached dozens of local companies as they approach Launchpad’s final round. Since 2012, Launchpad has awarded more than $1.2 million in seed funding to Birmingham startups, many of which were mentored through the BBA. The best mentoring, Brown said, comes from listening to the company and its needs. From there, the BBA shares tools a business can use that are helpful for its growth. This can range from the creation of a business plan for a startup to understanding opportunities to obtain incentives for the expansion of a company’s operation. The BBA utilizes a network of resource partners to give businesses from startups to mature businesses the best mentoring possible. “A fresh set of eyes can and will uncover blindspots that can lead to greater opportunities for business growth,” Brown said. BLOX, XpertDox, Illumicare, Cheeriodicals, Proventix, Swell Fundraising, Alasaw and, recently, Farm Bowl + Juice Co. are just a handful of companies the BBA has mentored. Synder is thankful to Brown for his honesty and his external viewpoint, helping her see what she might not have internally.